Less pain, fewer scars, and quicker recovery: minimally invasive surgery gets you back to your life and the people you love. At Middlesex Health, we know that surgery is an interruption. But with minimally invasive techniques - such as videoscopy and da Vinci® Robot-Assisted surgery - our surgeons can deliver the surgical care you need with more precision and less trauma to the body. This means that there is a lower risk of complications and much shorter recovery time - so that you can return to your normal activities as soon as possible. Videoscopic surgery allows physicians to see and work inside the body without making the large incisions required by traditional surgery. Instead, the surgeon uses small “ports” through which surgical instruments are passed. A videoscope – a tiny video camera connected to a television monitor – functions as a visual guide for the surgeon. What procedures are performed with videoscopy? What is AESOP Voice-Activated Robotics? In traditional videoscopic surgeries, the laparoscope or endoscope was held by an assisting physician or nurse, often resulting in unsteady positioning. With the AESOP system, a robotic arm "hovers" over the patient and holds the scope, giving the physician a steady, clear picture of the surgical area. Since the system is computer-driven and voice-activated, the physician can have instant positioning on command and even "save the position" for later recall. How does videoscopic surgery benefit patients? 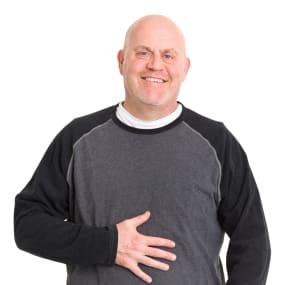 Gastroesophageal Reflux Disease (GERD) - also known as reflux or heartburn - is a common condition that causes discomfort and even debilitating pain for millions of Americans. For some patients, medications do not provide relief, but there are surgical alternatives that can help. At Middlesex Health, we are proud to offer multiple surgeries for the treatment of GERD through our Center for Advanced Surgery. Gastroesophageal reflux disease (GERD) is a chronic, painful and debilitating condition in which the stomach acids surge upwards from the stomach into the esophagus, causing a harsh burning sensation. The condition occurs because the lower esophageal sphincter (LES) fails to close, allowing stomach acids to reflux - or rise up - back into the esophagus. The LINX Reflux Management System is an innovative method for the treatment of Gastroesophageal Reflux Disease (GERD). What is the LINX Procedure? How does it work? The LINX Procedure allows your surgeon to restore your body's natural ability to prevent reflux. The surgeon will place a tiny ring of magnetic titanium beads around the junction between your esophagus and stomach. The magnetic ring opens when you swallow, so that food can pass into your stomach normally. It then closes quickly and is strong enough to keep acid and bile from coming back up into your esophagus. Is the procedure permanent? Is there a long recovery period? How do I know if LINX is right for me? The LINX Reflux Management System may be appropriate for patients with reflux/GERD who have not had relief using over-the-counter or prescription medications. You can contact us or ask your doctor if LINX may be a good option for you. In this procedure, which is performed laparoscopically, your surgeon builds a new lower esophageal sphincter (LES) by wrapping the upper portion of the stomach around the lowest point of the esophagus. The new LES prevents reflux of stomach acid into the esophagus. Is it difficult to recover from this surgery? Advances in minimally invasive, videoscopic surgery mean that patients recover much more quickly from surgery. Most patients are in the hospital for two to three days are can return to work within a week. This is much easier than recovery from traditional surgery, which required a 10 day hospital stay and approximately six weeks of recovery. Studies have shown that more than 90% of patients who have a Nissen fundoplication are symptom-free after 10 years.